Though concrete evidence of Apple's long-rumored foray into the Smart TV business largely boils down to a one-off comment made by the company's late co-founder shortly before his passing last year, several established TV makers are taking no chances and are reportedly scurrying to form alliances with one another to help defend their turf from the booming tech giant. In particular, TPV Technology and LG Electronics are said to be either forming alliances with one another or are seeking out additional partners for smart TV alliances, sources speaking to DigiTimes say. They add that China-based TV brand Changhong has also formed an alliance and is placing bets on a cloud-based interface for its offerings which it hopes to solidify within three years. The sources said the alliances are also forming as Apple is preparing to release a smart TV. 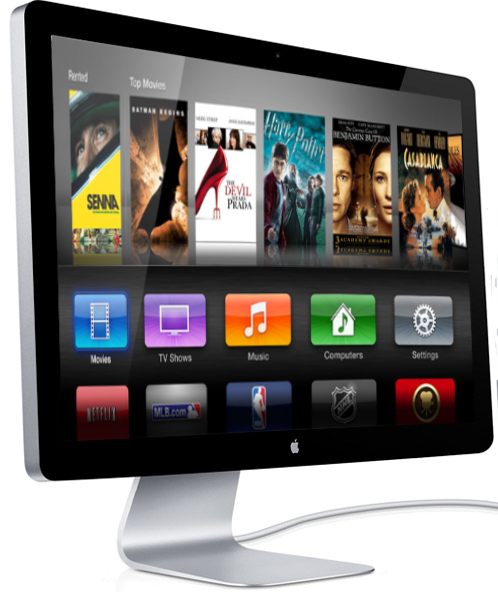 Due to Apple's influence in the market, the sources fear it will further dominate the smart TV market, which is estimated to reach a 40% penetration rate by 2014. Largely oblivious to tight-lipped Apple's precise plans for shaking up the Smart TV segment, these alliance-forming TV makers are reportedly banking on features for their own designs that will resemble those available from Samsung's industry-leading set designs. But they "will still need a lot of time before models start hitting stores," those same sources say. Meanwhile, mounting evidence in recent months suggests Apple is poised for yet another mult-year head start on the competition, with financial analysts and reports out of the Far East indicating that the company plans to begin ramping production of its first Smart TV designs later this year for an introduction no later than early 2013. Industry watchers believe that a recent $800 million deal between Apple's manufacturing partner Foxconn and panel supplier Sharp was secretly driven by the initiative. It is expected that both companies will play a crucial role in building the television lineup if and when it launches. In much the same way that Apple revolutionized the music and mobile computing industries by pioneering new interfaces and methods of consumer interaction within those mediums, the catalyst for an Apple Smart TV is widely believed to be the introduction of a more natural means of communicating with the device itself and accessing content remotely. World renowned for re-inventing broken technology, Apple co-founder Steve Jobs last year revealed to biographer Walter Isaacson that he had "cracked" the concept for the future of television that would be synced with all of a user's devices, and with Apple's iCloud service. He hinted that such a device would spare users from having to use complex remotes for multiple devices like DVD players and cable boxes. Isaacson would later write in his top-selling biography that Jobs "wanted to do for television sets what he had done for computers, music players, and phones: make them simple and elegant." "It will have the simplest user interface you could imagine," Jobs was quoted as saying. "I finally cracked it."